The Cuisinart CFS-TC-S6BS is a 6-piece rectangular storage containers set that keeps food vaccum sealed and fresh for longer time. These are scratch resistant containers, efficient of locking out moisture and air. The containers are dishwasher safe and stain resistant. The 6Pc Set Black/Stainless Steel Fresh Edge Food Storage has many exciting features for users of all types. See the 6Pc Set Black/Stainless Steel Fresh Edge Food Storage product video above for more details. 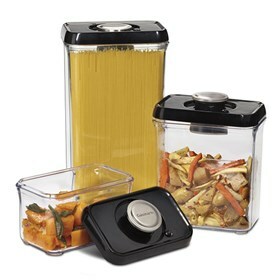 The 6Pc Set Black/Stainless Steel Fresh Edge Food Storage is sold as a Brand New Unopened Item.